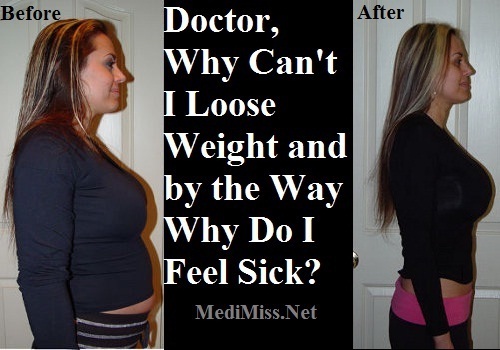 MediMiss albicans asthma Candida Albicans Depression dizziness fatigue Headaches Health hypoglycemia irritable bowel syndrome Remedies weight loss Doctor, Why Can't I Loose Weight and by the Way Why Do I Feel Sick? 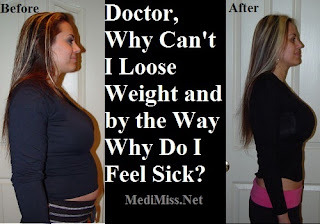 Doctor, Why Can't I Loose Weight and by the Way Why Do I Feel Sick? This the number one question heard in my office and in physicians' offices throughout America. There is a strong relationship between weight gain, difficulty in losing weight and feeling sick. Candida Albicans, an opportunistic fungus, is often the link between weight gain, feeling ill and the difficulties people have with losing weight. Focusing on removing Candida Albicans from the body rewards the dieter with a feeling of well being and weight loss that is steady, sustainable and healthy. Americans are embracing the low carbohydrate diet for its ability to reduce their waist size and weight even when other diets have failed. The more important benefits of a low carbohydrate diet are usually lost in our obsession with weight. Low Carbohydrate diets have been used by nutritionists and holistic physicians for decades to control Candida Albicans. The weight loss and feeling of well being that accompanies a low carbohydrate diet is mostly associated with controlling this serious, but often over looked health condition. I often see patients in my office who want to lose weight and have tried every diet and pill on the market with little success. During their history they often reveal a list of symptoms and complaints that they feel have no relationship to their weight problem. These patients do not realize that their weight problem and their other complaints are symptomatic of a more serious health condition known as systemic Candida Albicans. By concentrating on treating the underlying Candida Albicans my patients are able to loose weight and improve their overall health. Betty F. . . was consulting with me for continued weight gain. She was finding it difficult to stick to a diet and exercise, partly since she saw such limited results. During her consult she admitted to gas, indigestion and fatigue. Her history included birth control pills, antibiotic use and several yeast infections. Her treatment plan included a low carbohydrate diet, nutritional supplements, and anti fungal herbals. She returned is 4 weeks, she had been able to stick to the diet with much greater ease, she felt more energetic and had no more gas. She was even happier that she had been able to loose 9 lbs. She reached her goal of a total weight loss of 22 lbs over the course of 3 months and has been able to keep it off. She now sticks to a sound diet and only takes a multi nutrient with herbals. Candida Albicans is opportunistic yeast that often over whelms the body after antibiotic, may be passed from person to person with the exchange of body fluids, and from direct contact. It may be found in the reproductive tract, the mouth, the GI tract and in the blood. There are several common signs of Candida Albicans including vaginal yeast infections, thrush, jock itch and athlete's foot. Candida Albicans has been linked to a number of health conditions including; asthma, depression, dizziness, fatigue, headaches, hypoglycemia, Irritable Bowel Syndrome (IBS), learning disabilities, menstrual problems, Migraines, Multiple Chemical Sensitivity Syndrome (MCSS), Prostatitis, sinus problems, and Urinary Tract Infections (UTI). One of the major secondary problems associated with Candida Albicans is weight gain. A number of the problems associated with losing weight and staying with a diet are doing to Candida Albicans. A person with systemic Candida Albicans will often crave sugar and simple carbohydrates because this is the main source of nutrients for yeast. Mood swings and depression are often associated with the rapid change in blood sugar levels caused by the yeast. Patients often complain of gas and bloating caused by the fermentation of foods in their intestines by the yeast which naturally release gas, just like in Champaign and beer. The fermentation of foods in the intestine may also lead to alcohol production that is absorbed through the gut and may lead to symptoms of confusion, altered behavior, and difficulty concentrating. Determining whether you have a Candida Albicans can make a big difference on how easy you will be able to lose weight and keep your weight loss off. 1. Have you used antibiotics in the last 2 years? 2. Do you have gas or bloating? 3. Do you have sugar cravings? 4. Do you have low blood sugar? 5. Do you have history of yeast infections, vaginal, oral, athletes foot, or jock itch? 6. Does your partner have a history of yeast infections, vaginal, oral, athletes foot, or jock itch? 7. Are you sensitive to smells? 8. Are you sensitive to alcohol? 9. Do you suffer from symptoms that your doctor cannot explain like; headaches, migraines, depression, diarrhea, dizziness, IBS, menstrual or sinus problems? 10. Do you feel fatigued all the time? 11. Do you have a hard time concentrating? 12. Do you just not feel right? Candia Albicans can be diagnosed by a blood analysis by your physician, though many traditional physicians do not regularly order this test. A major problem with treating Candida Albicans is the low regard most physicians place on controlling it spread. A recent study showed that 27% of nurses and 33% of doctors have Candida Albicans on their hands in a hospital. You can get a reasonable idea if you have problems with Candida Albicans by answering the questions in the box above. A yes answers to 6 or more questions above, associated with any of the signs or symptoms listed above, is a good indicator that you may have a Candida Albicans problem. Dr. Mark Leder, a chiropractor and nutritionist in NYC, states " I have treated thousands of women for weight loss and I find that over 75% of them are suffering from Candida Albicans. I tell them, you want to loose weight,? You want to be healthy? Deal with the Candida problem and everything else will follow." A low carbohydrate diet is the first step to dealing with Candida Albicans, but an herbal anti fungal is just as important. When Candida Albicans presents itself as a vaginal yeast infection or athletes foot will often be treated with medication. Medications may be oral or topical and can be in prescription or over the counter strength. The problems with medications is that they are often short term and or do not get to the root of the problem. To properly reduce the amount of Candida Albicans in the body a low carbohydrate diet is the first step. Nutritional and herbal supplements are also key components. Regular intake of natural anti fungal supplements gives the body a chance to gentle and slowly reduce the amount of Candida Albicans in the body. There are a number of natural anti fungal herbals and products available on the market, but quality and effectiveness vary greatly. One of the best products available, through physicians offices only, is called RxBotanicals Diet Enhancer which contains powerful anti fungal and natural herbal relaxants. The combination of anti fungal and natural herbal relaxants found in RxBotanicals Diet Enhancer gentle lowers the amount of Candida Albicans in the body while making the dieting experience easier and more successful. America will continue to focus on the weight loss associated with low carbohydrate diets. Nutritionists and physicians will continue to embrace the multitude of health benefits associated with a low carbohydrate diets with herbal remedies and its relationship to reducing Candida Albicans in the body.